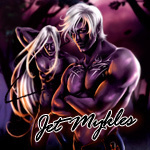 To ask Jet Mykles questions, please sign up. Jet Mykles Usually it's a very pretty man, either in my mind or someone I see when I'm out and about. The post Fiction – Pet appeared first on Jet Mykles. Description: The fifth book of the Dark Elves series was released Tuesday, Sept 16 from Loose Id. blade wrote: "Can't wait for Noble and Foxy! And, of course, P.L. 's cover art." Can't wait for Noble and Foxy! And, of course, P.L. 's cover art. Thank you for accepting my Friend Invite, I just Love your Writing....I CAN'T wait for "Tangled Leashes" (Leashed #4) to be released! Your Cover Art is Gorgeous & the Excerpt was GREAT!!!! Thanks for accepting Jet! Big fan of your books! Thank you for accepting! Love your reads!!! Thanks for friending me, Jet! Thanks for accepting my 'friendvite'. Congratulations on Reverb. It's a great book! My new book, The 9 Ghosts of Samen's Bane, is available now at amazon.com and target.com. Have a great day. LOVE your short stories!!! Just ordered the whole Dark Elves series! Can't wait to read them. Awesome!! Can't wait to read it. Just finished Tech Support. Almost didn't buy it because my son's name is Aaron.lol! But I just couldn't resist. It was great! Loved the geek meets handsome prince premise. Keep 'em coming! Rabin's story is in the pipeline. He'll be in the sequel series to Heaven Sent. it's called Indigo Knights which, you may recall, is Rabin's band. Just finished the Heaven Sent series. Holy #$@*&%@, was that series hot. Loved the premise and the guys. Hope to read more about there lives and hopefully about Rabin(hint,hint). Keep up the good work! !